Your team members need to know what is expected of them before they can be held accountable for it. Be clear about what the team member needs to do – ie the what by when and to what standard. Goals help keep us on track. The more clearly these expectations and goals are set up front, the less time will be wasted later clarifying what was really expected. Your team member is more likely to do this when they ‘buy in’ to the goal; when they have context for each assigned task. Team members are more likely to connect to a goal when they understand how this goal fits into the ‘bigger picture’ and why achieving it really matters. It is also important to allow for frank ‘give and take’ discussions regarding these specifications and limits. If you can’t measure it, the ability to hold someone accountable for an assignment of responsibility will be difficult. Information is needed to hold your employees accountable to the expectations that have been agreed. Make sure the system to monitor progress facilitates opportunities for feedback again these dimensions. It is essential that people receive feedback about the progress they are making towards the goal. People’s motivation to increase productivity will only occur when they have a challenging goals and receive feedback about the progress they are making towards that goal. People also need an opportunity to understand where they may be falling short of expectations and discuss options for how they can improve performance. Setting expectations followed by quality feedback is the backbone of holding someone accountable for results. Ensure the lines of communication remain open so any risks of potential deviation can be managed appropriately. Employees need to understand the consequences of non-delivery – on all stakeholders. Their commitment to delivery of the goal can be enhanced by this understanding. These consequences can also be personal to them. It is important that these consequences are appropriate for the situation, are communicated and understood by all, and if delivery does not occur, they are followed through. This may be uncomfortable for everyone, but fair and reasonable consequences necessary if a culture of accountability is to be maintained. On the flip side, it is also important to share the upside of delivery. Linking to the positive benefits or results on the stakeholder, or the individual personally is also powerful. Review whether the goal has been achieved to the standards agreed. Also review the process you followed. What worked? What didn’t? What could be done differently next time? 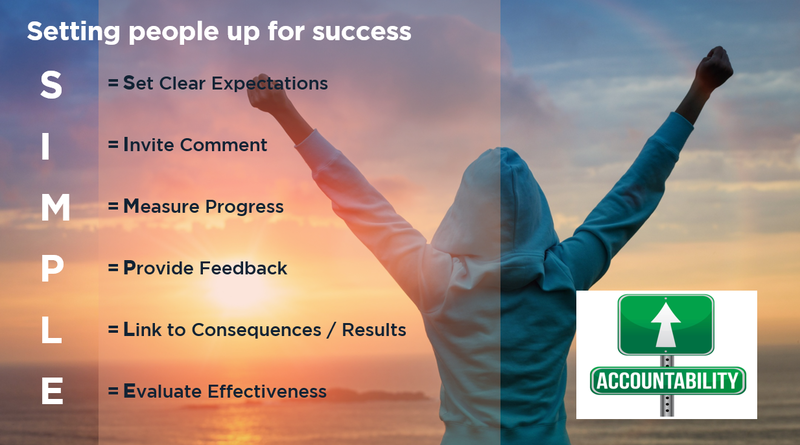 Click here to download our tips and hints on holding people accountable. ← Making progress – Are you focusing on the most important motivator?